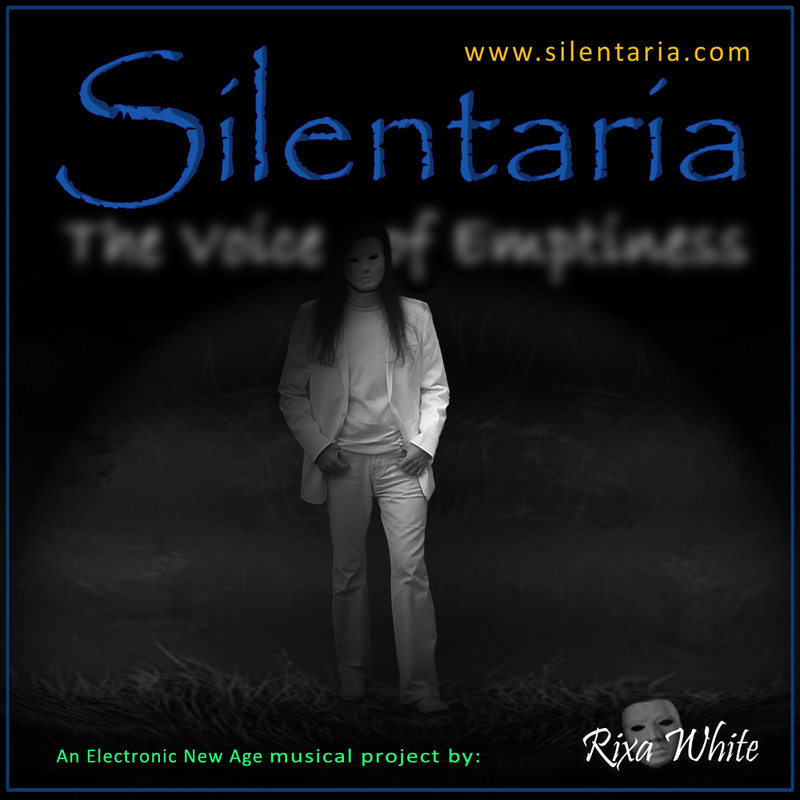 Silentaria is an Electronic New Age musical project founded in 2010 by Rixa White, a self-taught pianist, keyboardist, composer and poet, known as “Man in White”. The project’s music combines elements of Electronic, New Age, Contemporary Instrumental, Ambient and Progressive Rock genres. It is the reminiscence of New Age and Electronic music projects such as Enigma, Yanni, Jean Michel Jarre, Kitaro, Vangelis and Era. Silentaria music is mainly instrumental and vocals are occasionally used to highlight its message. All these few lyrics are written by Rixa White. The main instruments are Keyboards, Synthesizers, Strings, Flutes, Electric Guitars, Drum Machines and Digital Choirs. Rixa White also uses digital sounds like computer-generated human voices to his music. 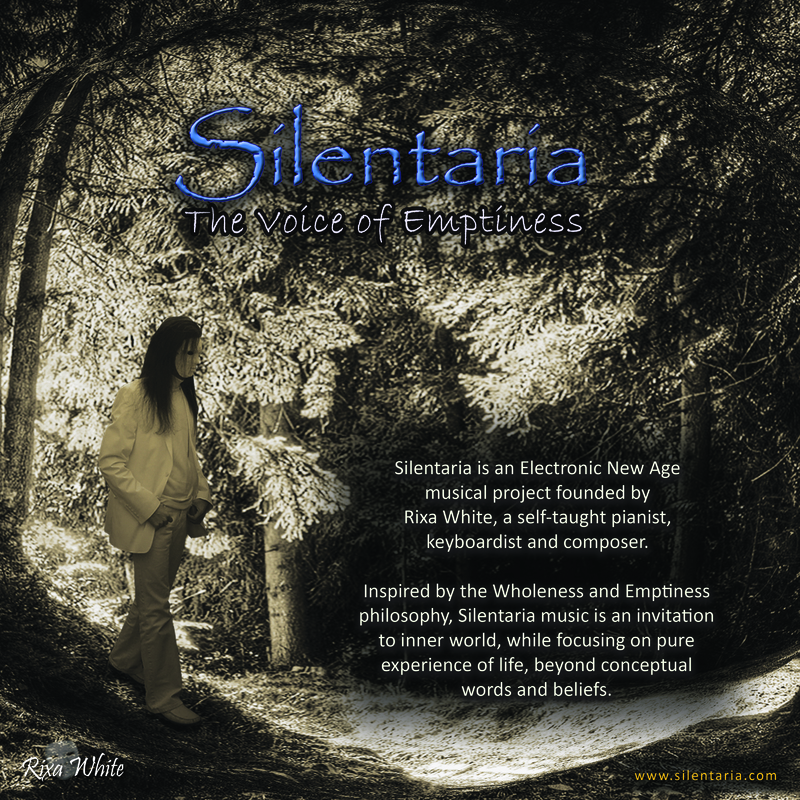 Silentaria is inspired by the Wholeness and Emptiness philosophy. Its voice is an invitation to the inner world which is silent but the source of every sound. This manifests Silentaria’s slogan: “The Voice of Emptiness”. New Age: From conceptual point of view, Silentaria is a New Age music but in a very different way. Its purpose is not relaxing the audience or pretending that everything is fine and perfect in life. Instead, it encourages listeners to experience life as it is and face the contradictions by uncovering the inner world. Know more about this diversity here. Main tracks of this genre are “Oceans of Illusion”, “The Ruined Innocence” and “Hidden Utopia”. Electronic: A wide range of freshly-made synths, computer-generated human voices, digital sound effects, drum machines and powerful ARPs has made Silentaria music sound in Electronic genre. Rixa also alters and polishes sonic outputs by digital mixers and filters. The Energy element comes from this aspect, however, he intends to avoid overusing repeated baseline and beat oriented patterns. His music relies much more on dynamic meaningful melodies rather than heavy use of technology. Tracks like “What’s Real?”, “The Beginning of the End”, “Vital Doubts” and “Beyond Destiny” come from this genre. Contemporary Instrumental: Proper use of classic instruments and percussions is a must for Rixa to create Epic, Urban and Romantic atmospheres. Strings, Violins, Flutes and Pianos together with classic Drums and percussions folded in an Electronic frame develop a live heroic and passionate theme. Tracks like “Return of the Lost”, “Diversion” and “Sorrowful Truth” are essentially from this genre. Ambient: In most of track intros, Silentaria uses Ambient spaces to prepare the listener for the main message. Besides there are tracks like “Emerge”, “Mirage” and “Lament of Being” which are semi-ambient in context. Progressive Rock: The tracks with Rebellious themes are usually from this genre. Although Electric Guitars are used in some tracks as leads or riffs, the aggressive atmosphere mainly explodes from the symphonic melodies and compositions. Tracks like “Deceived“, “Curtains over Eyes” and “One Last Quest” mainly represent this genre. Know more about Rebellion element in Silentaria music here. Other Genres: There are tracks like “Eastward” and “Echoes form East” which are in World genre. They benefit from Eastern and Middle Eastern instruments and percussions to decorate the music and generate an exotic cultural fusion. Silentaria benefits from the synergy of a powerful triangle of Melody, Atmosphere and Structure. Rixa believes that melody is everything in music. He insists that bare melody should impress the audience no matter what the music context is. That’s why in Silentaria, melodies are the most fundamental and noteworthy elements. They are emotional, inviting, dialog-based and narrative even the complaining ones, which fit the storytelling approach to the concepts (like “Farewell” and “The Ruined Innocence”). Along with the melodies, richly synchronized components like harmonies, rhythms and sound effects are main factors to make Silentaria music unpredictable (like “Deceived” and “Diversion”). The multi-layered atmosphere of the tracks is mainly constructed by five expressive moods: Sorrow, Rebellion, Mystery, Epic and Energy. These elements emphasize the effect of each track’s message and make it memorable. Besides, constantly changing levels of sound volumes and pannings develop deep multi-dimensional spaces that are lively moving. Usually tracks follow a unified style (like “Vital Doubts” and “Lament of Being” ) but there are tracks that have multi-style atmosphere expressing different stages of track story using mood diversity (like having Techno after first Urban half in “Consciousness” or Symphonic style after Jazz intro in “Return of the Lost”). Almost each track benefits from an intro, sometimes a bit longer than usual, to patiently prepare the space for transmitting the message. They often match the main atmosphere of the track (like “Mirage” and “Diversion”) but sometimes they surprisingly have different texture to create more attention and shock (like “Curtains over Eyes”). In most of the tracks music body where usually very few repeating melodies can be found, harmonies play a great role for clothing the melodies and make the messages more understandable and practical (Like “Farewell” and “Real Fantasia“). Endings are considered to hold and wrap up the impact of the track and message, so even they simply fade, they are rich and meaningful to the last second (like “The Beginning of the End”, “Echoes from East”, “Mirage” and “Return of the Lost”). Instruments: Silentaria employs a variety of instruments and doesn’t focus too heavily on a single one. There is no limitation in using instruments. Classic instruments like Strings, Violins, Flutes, Guitars and Drums incorporated with Electronic Keyboards, Synths, Pads, Electric Guitars and Drum Machines are used to play melodies and harmonies more effectively. Lyrics: As Silentaria music is mainly instrumental, vocals are occasionally used to highlight the message. By the way, Rixa writes all these few lyrics and plays them with computer-generated vocals as a musical element (like “It’s time to go” and “What’s Real?”). Computer-generated Human Voice: Vocals are predominantly computer-based. One of the most applied voices is the Breath which is the most vital act in human’s life, projecting sadness, frustration and pity. Robots, Female Angels, whispers are main forms of these voices. Sound Effects: Sound effects help melodies to express the mood and multiply the impact of music atmosphere.